Posted on Mar 7, 2012 by Appleton Downtown Inc.
Lawrence University, Wriston Art CenterPierre Bonnard was a member of the Nabis (Hebrew for “prophets”), a Parisian Post-Impressionist group whose aesthetic influences included Japanese ukiyo-e woodblock prints and whose goals called for a greater connection between art and everyday life through a synthesis of fine art and ordinary subjects. The democratic nature of printmaking was therefore ideally suited to Bonnard, as the multiple impressions of a print could be experienced by a relatively broad audience. Additionally, he benefited from technical innovations in color lithography, his primary print medium, which had led to renewed interest in printmaking in the 1890s. Bonnard created more than one hundred twenty editioned projects between 1891 and 1947, including designs for theater programs, exhibition announcements, sheet music, book and journal illustration, and individual prints. His first poster commission, an advertisement for champagne, appeared in 1891 and was an immediate success. 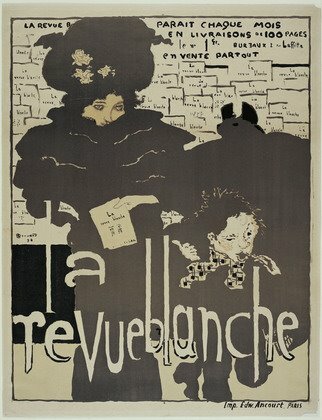 This was eventually followed by nine other posters, including this one for La Revue blanche, a Parisian periodical that published work by avant-garde writers and included prints by contemporary artists. This and Bonnard's other posters bear many of the same design hallmarks: unmodulated color, a playful depiction of flattened space, and a decorative handling of silhouettes and textures.